An inventive way to serve up breakfast for a crowd! Preheat the oven to 350ºF. Grease an 9 1/2-inch springform pan with the butter and wrap the bottom and sides tightly with foil. Bring a large pot of salted water to a boil. Add penne noodles and cook 2 minutes less than than al dente according to the package instructions. Drain and remove noodles to a large bowl and set aside. In a medium saute pan over medium heat, add the pancetta and cook until fat has rendered and pancetta is nearly crispy, about 5-6 minutes. Remove to a paper towel-lined plate and set aside. In a medium bowl, whisk together the milk, heavy cream, eggs, 3/4 cups of Parmesan cheese, pepper, and parsley. Season with salt to taste. Pour the egg mixture into the noodle mixture, stirring to coat. Stir in the cooked pancetta and large breadcrumbs. Remove to the greased baking dish and top with remaining Parmesan cheese and breadcrumbs. Place in the center of the oven and bake until golden brown and bubbling, about 15-20 minutes. Remove from the oven and allow to cool slightly. 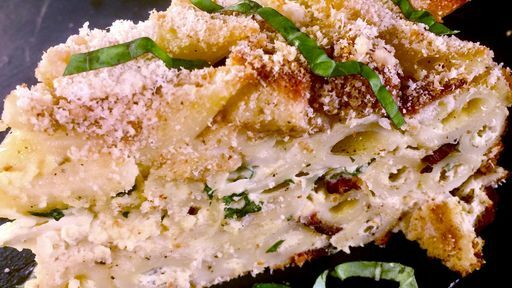 Remove the pasta casserole from the springform pan and slice into wedges. Tip: Prepare the casserole the day before and hold in the refrigerator until ready to bake the next morning!